warns Morgan. Then Jack and Annie are whisked back to ancient Ireland. They land on a cliff on a misty island. How will they find the story they are looking for? 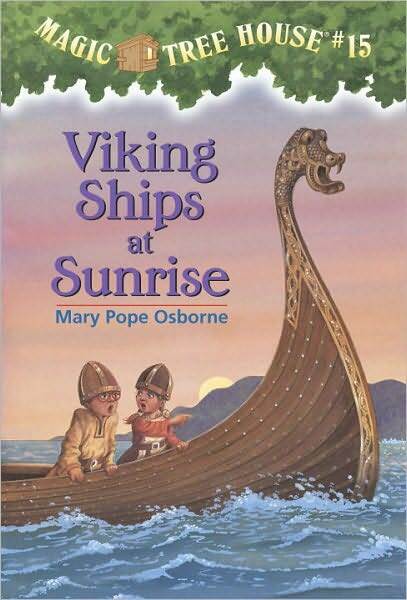 It will take a Viking invasion, the help of a jolly monk, and a lot of courage for Jack and Annie to succeed in Viking Ships at Sunrise. This book was great because it started a conversation for us about all the different religions and ways of serving our God. The concept of a monk was difficult to understand but I had also checked out The Sound of Music for us to watch during a rest time this week and it was then great to give her a visual of what I was talking about with Nuns, Monks, etc. Another success for the Magic Tree House books…next (and the timing is amazing) book Hour of the Olympics! !